Fig 1 from the Fair-rite data book shows the complex permeability characteristic of #43 ferrite material. In fact, the data presented in Fig 1 is measured on a toroidal core with a small winding, the datasheet states that in this case it was [m]easured on a 17/10/6mm toroid using the HP 4284A and the HP 4291A , and probably using just one turn. This characteristic means that a small inductor wound on a core of #43 material so that there is very little flux leakage will have a complex impedance with X/R=µ'/µ''. The frequency at which R=X is a good 'signature' for the material type, #43 crosses over at about 14MHz in the above diagram. It is vital that this measurement is done with as few turns as necessary to give a reliable and accurate reading on the measuring instrument. More turns means increased stray capacitance and the impedance will not longer obey the simple model X/R=µ'/µ'' due to the capacitance. On the other hand, measuring and impedance of the order of ohms with the ubiquitous MFJ-259B does not give accurate results. 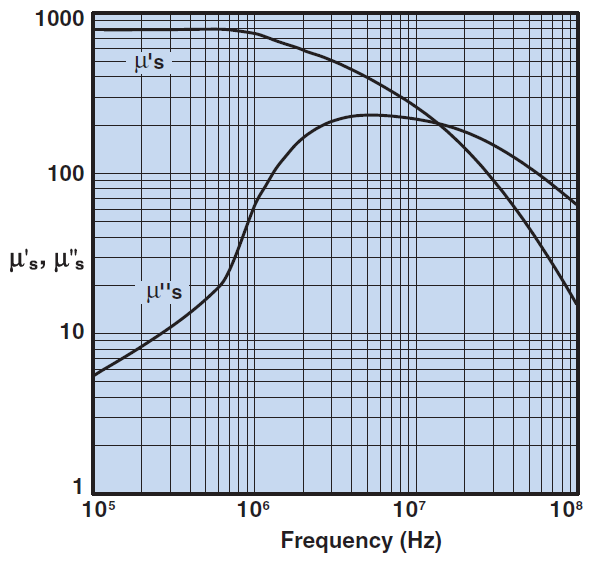 If the inductor has appreciable flux leakage (eg a rod), then the flux leakage results in a departure from X/R=µ'/µ''. Note that ferrite materials are subject to manufacturing tolerances and variation with temperature, so do not expect 1% accuracy in applying datasheets to real cores. Table 1 shows the cross over frequency and µi for some common Fair-rite materials. It can be seen that although #33 and #43 have similar µi, their RF performance is quite different, due in part to the fact that #33 is MnZn ferrite and #43 is NiZn ferrite. If one was to classify an unknown core of type #43 or #33 based on µi alone, allowing for manufacturing tolerances, temperature and measurement error, it would be very easy to wrongly classify it. Likewise, other manufacturers may have cores of fairly similar materials, and measuring µi alone gives no indication of the RF performance, or a valid comparison with a known core.